Vino Pop™ wine opener harnesses the power of air to “pop” the cork right out of the bottle without any damage in seconds. Just open your wine bottles in 3 easy steps; PUSH to insert the pin, PUMP the handle, and POP the cork comes out! No more damaged corks or bits of cork floating in your wine. 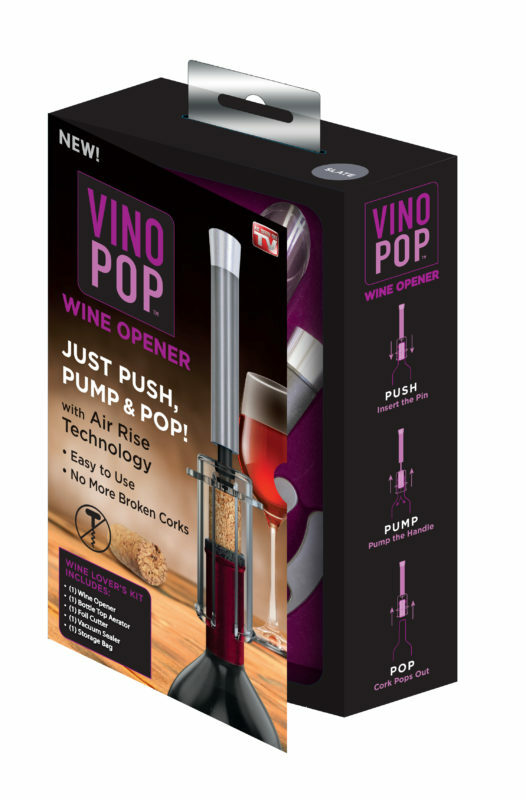 Vino Pop™ wine opener does not require batteries or CO2 cartridges and is faster and easier than using wine keys or battery operated wine openers! This 5 piece kit is easy for anyone to use; includes (1) Wine Opener, (1) Aerator, (1) Foil Cutter, (1) Vacuum Sealer and (1) Storage Bag.